Batch barrels are perfect for cleaning parts that can be batched and tumbled in large groups. Parts tumble in a "C" configured conveyor belt system while a blast wheel propels abrasive into the cup of the C. Ease-of-use and ease-of-maintenance are key design elements providing maximum productive work hours. 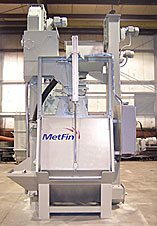 Batch blasting is the most cost-effective method of blasting, provided components can tolerate the tumbling action. Batch barrels can be integrated with a variety of material handling options to provide a range of automation levels including fully automated systems. Batch barrels come with rubber or steel mill belts in 6 standard sizes: 3, 6, 12, 15, 20 and 22 cubic foot capacities. Call us to determine the best size for your product needs. Rotary barrels are the choice for blast cleaning very small parts that can be batched and tumbled. A cement mixer type of tumbling chamber presents parts to the blast wheel providing a simple, yet effective blast cleaning solution. Rotary barrels can be configured to provide fully automated processes. Rotary Barrels come standard as 3, 6 or 12 cubic foot capacity models. Modular design allows for simple assembly of the equipment on site. For more information about Batch Barrels and Rotary Barrels please call us today at 860-668-1050. 15 Cube Batch Barrel with cast manganese mill and fully automated load system. 3 Cube Batch Barrel with magnetic separator for removing sand or ceramic contaminants.